All beds have linen provided to include a bottom sheet, a flat sheet, a pillow and warm duvet. Special requests can be catered for, e.g extra blanket, fan etc. Standard rooms - singles, double, twin, triple or multi-share bunk rooms which have shared bathroom facilities. Ensuite rooms - double, twin or multi-share bunk rooms with their own bathrooms. Female only rooms are usually available on request. Please note that the latest arrival/check-in time is 10pm. We have an accessible room - pre booking recommended. Separate mens and ladies bathrooms are provided for those guests in our standard rooms. The kitchen is fully-equipped, so whether you wish to make a quick snack, or a gourmet dinner, you should find what you need. We also provide free herbs & spices too. It has gas cooktops, a conventional oven and a microwave oven. There's even washing up equipment for your enjoyment as well! This space provides a friendly, informal place to meet fellow travellers, share your travel tips and just relax at the end of your day. We have free Wifi for you to use too! We have plenty of secure off-street parking available – no need to pre-book. This is a popular way to unwind if you've had a hard day climbing a volcano, cycling around the local attractions or paddling a raft down a raging river! Open 24hrs. Just the place to enjoy breakfast or relax on a sunny evening. Our gas fired BBQ is free to guests & is large enough to cater for a group meal. It includes special trout grillers if you had a lucky days' fishing… add a little lemon and white wine and you're on your way to a gastronomic delight! 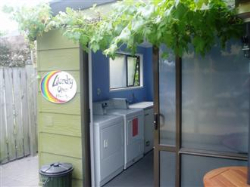 We have a guest laundry with heavy-duty washers (hot water washes) and large gas fired dryers as well as an outside drying line. We offer a great range of dvd's for the more relaxing evening after a busy day of adventure or relive those exciting ski dive or bungy moments. There is bike hire facilities for those wishing to sightsee as well as a lock-up for cyclists use. For more on the bikes click here. We have a quality table for your enjoyment. Our Common room area has a display of many of Taupo's popular activities & natural attractions. We can assist you with information and reservations on these and we can give you personal perspective - we have tried just about all of them for ourselves!. See our "Activities" page for ideas on planning some of these. We are a five minute stroll to both Pak N Save and Countdown Supermarkets.